Each answer is also a Major Arcana Tarot card (though there may be some fiddling with articles and pluralizations; naturally I'll be lenient about it). A mass or a miasma, depending on which They Might Be Giants song you ask. A kind of dragonfly, bird-of-paradise, or penguin. Michael Barrett (1841-1868) was, publicly, the last one in Britain. A 60's record label, their name later used by MTS Inc. for retail stores until their 2006 liquidation. 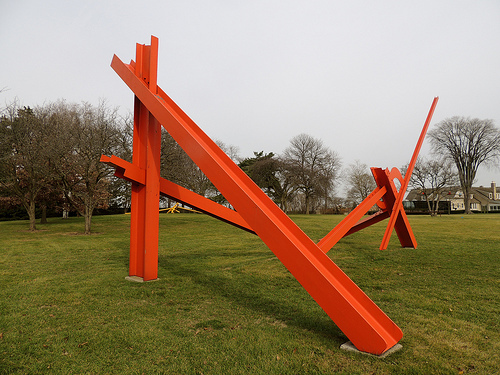 This sculpture by Mark di Suvero; fitting that there are two pieces to it. An early version, running 1952-1953, rewarded Good Samaritans with prizes for their deeds. The movement that had substantial legislative successes in America and Norway in 1919. A member of Herman's English beat/pop band and rival to The Beatles. A 2010 film by M. Night Shyamalan starring the Chris Messina who didn't invent the hashtag. Val Valentino appeared in four Fox TV specials between 1997 and 1998 as a masked one, only revealing himself in the final episode. An ancient Greek term for one who interpreted arcane knowledge and sacred mysteries. The English-translated name of a book by René Descartes, also called Treatise on the Light, published posthumously in 1664.